In a desperate bid to take back the continental United States - where hordes of undead now dominate the ravaged human population - a Navy commander leads a global mission to the heart of the pandemic. Task Force Hourglass is humanity’s final hope, and his team’s agonizing decisions could mean living one day more - or surrendering to the eternal hell that exists between life and death. Shattered Hourglasss is the terrifying new novel in the acclaimed zombie apocalypse series. ©2012 J.L. 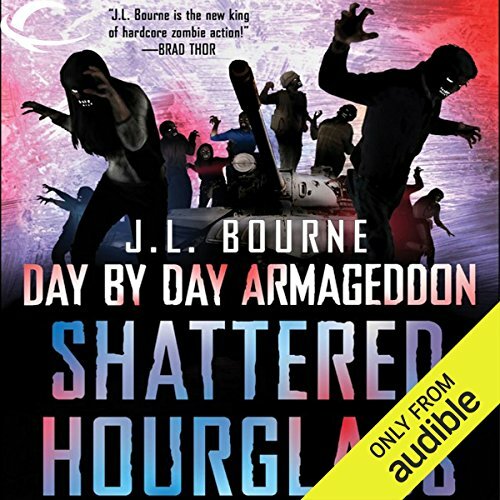 Bourne (P)2012 Audible, Inc.
Bourne is responsible for my Zombie obsession. The first and second book of the series is awesome. Shattered Glass veers off course into choas leaving me unable to focus on the situations, scenarios, and characters. Say goodbye to the journal format of the last two books and hello to multiple character situations, which tugs on my ADD. LOL! The fascination with the main character's struggle has ended with the elimination of the journal format making the listen not enjoyable, hard to follow, and weak! The positive side is the closer to several elements of the story and characters. The book WAS worth the credit! Would you try another book from J. L. Bourne and/or Jay Snyder? Wow, I listened to this book for about the first four hours and then began to realize that this is not what I expected. This is what we waited 2 years for? I can't believe at all this is the same Author who wrote the 1st two books which are among one of my favorites in Zombie culture titles. I loved the series and told all my friends how this one series was an all night scary listen! But this book was not the same timeline format as the first two successful books. This storyline jumps like a cat dancing on a hot plate as I was back and forth trying to figure out what and why did he bring in new characters and ignore the pre-established ones we loved and cared about. The name Kill as a character said it all as I groaned as bad as the zombie's moaning in the story. Why and how he made the main character act like a whinney B_tch is unforgivable to start and how predictable it played out was no surprise. I have to believe this was a paycheck to the writer as there was no effort put into this book. How and why The Author changed the format was bad advice, maybe because he was on deployment most of these years, it may have distracted his focus. I would have gladly waited another year for a more suspenseful type story just like the first two books were written. I know this is a harsh review but I really feel let down as a reader and fan of the series. I would recomend people to just pass on this version and hope there is another creative author that could do a timeline Zombie tale. sadly disappointed! where did you go J.L.? first, let me preface my review by saying dbda (day by day armageddon) and beyond exile are some of my favorite zombie books. i was extremely psyched about shattered hourglass coming out on 12/26. it was like a belated christmas gift. with that said, i was extremely disappointed by the time i finished listening to shattered hourglass. i loved the first two books, and that's why i'm soo harsh on shattered hourglass. many of the negative reviews of dbda cited the one-dimensional characters and the journal style story. me...neither bothered me. so, i was kind of surprised the journal style storytelling was totally abandoned. really, it's not a bad departure. it would've been really boring to listen to kill roy record his daily thoughts while submerged in a sub sailing to china. instead, j.l. tells almost all of the story in 3rd person. i don't mind that at all since the hotel 23 group is split up at the end of beyond exile, and it would've been impossible to capture what happened to them via kill roy's journal. shattered hourglass tells the stories of 6 different groups of people. 3 we already know of, and 3 we're introduced to. john (kill roy's neighbor), tara (kill roy's girlfriend he rescued from the car), granny deane and danny, and will, jan, and laura. while it's nice to follow their stories, what happens to them is totally predictable. thankfully, j.l. uses time skips of a couple of days to help time move along on the sub. i was shocked that kill roy and sane didn't talk much until the very end of the story, like the last hour! at the end of beyond exile, kill roy is coerced to join a team to venture to china to recover chang. suprisingly, only 4 seals are assembled for the mission: rico, rex, huck, and griff. throughout the 1st part of the story, they are hardly mentioned until the first part of the mission- they have to gain access to an underground military facility on the hawaiian island oahu. while the action is reminiscent of the first 2 books, i was kind of disappointed kill roy didn't join them. i can understand that since he was recruited as a consultant. instead, he plays a minor part as their eyes via a remote controlled drone. outpost 4 is one of the many covert artic research bases that was set up to drill ice cores to investigate what happened 20,000 years ago. in my humble opinion, this could've been an interesting short story on its own. j.l. starts to build their story- their plight to survive in negative 50 degrees as the dead come back to life and their fuel supplies running low. there was a lot of potential here, but everything j.l. was building gets abandoned to the very end. hotel 23 gets some new inhabitants: doc, billy, hoss, and disco. tf phoenix's goal is to investigate the drops by remote 6 and find out more about them. like the arctic outpost story, this culd've been a great short story in itself. the character's flashbacks of how they survived and became part of tf phoenix were great and even deserve their own book. once again, there's so much potential that it's disappointing that their story just abruptly ends. we finally get a glimpse behind the curtain. sadly, there is no great wizard of oz, but a megalomaniac who is known as "god." this is my biggest disappointment! there was soo much potential wasted. remote 6 were like the ultimate bad guys- they were secretive, powerful, mysterious, and feared. instead, their leader turns out to be a caricature of a bad comic book super villain. at the end of beyond exile we learn that a crashed alien craft is the reason for the outbreak. ok i guess. it was kind of a buzz kill, but it didn't affect my decision to download shattered hourglass the moment it was available. as i watched the time left dwindle, i kept thinking, "they haven't even reached china yet! maybe we're going to get another cliffhanger!" i was thinking damn...china's gonna be difficult. a billion zombies with maybe 3/10 being those special zombies. instead, the whole story ends in the remaining 50 minutes! overall, i enjoyed going back to the story and world i fell in love with. however by the end, i felt spurned b/c the ending of each story was rushed. so much potential was left on the table! it's frustrating! I'm sure the change from the previous diary style will irritate some readers; personally I get why the author made the change. The main group of characters is necessarily split up and he would have had to jump through major hoops for a single narrator to effectively capture what was going on in all the locations. So from that perspective I think it was a bold move to make the change. Unfortunately I'm not convinced the actual story held up to the switch in style. The writing is a little rough -- the author does struggle a little with the new voice -- but the first half or so of the book is pretty good, demonstrating several of the things that were so strong in the first two volumes. Bourne really does do zombie combat scenes extremely well and even three books in was pulling out scenarios and twists that kept it fresh. But the latter part of the book felt really rushed to me. Almost as if he couldn't quite decide if it was going to take 4 books or if he had to wrap it in 3. Some of the plot elements introduced in book 2 are wrapped up in what I felt was very unsatisfying ways and at the end I was left thinking that Remote6 and Chang really felt like a let down. The ending could leave it open for a book 4 so we'll see if he does go that route and puts some more meat on the bones. I'd still recommend the series and anyone who has read the first 2 volumes will want to know what happens but I do think this is the weakest of the volumes by far. Probably not, this was my third book from Bourne that I have read. What could J. L. Bourne have done to make this a more enjoyable book for you? He could have thought up a better more imaginative ending. It seemed as though Bourne had his deadline and quickly finished the story without the depth of the beginning.It was quite bothersome when the author hinted that an upcoming piece of information was going to be earth shattering and then the reader finds out that it is simply that aliens landed at Roswell, NM. When deep six gets nuked. Could you see Shattered Hourglass being made into a movie or a TV series? Who should the stars be? Yes it could be a movie. A haven't a clue about the actors. What disappointed you about Shattered Hourglass? Would you ever listen to anything by J. L. Bourne again? i think Snyder did the best he could with this trite nonsense, but really, he's just polishing a turd. in the end, it's still a badly written book. If you could play editor, what scene or scenes would you have cut from Shattered Hourglass? the entire ending was dull, but really so much crap filled the rest (aliens, no real zombie actions, no character development or even emotional inner dialogue). this book was terrible and i would not recommend it to anyone. I would definitely recommend the series. You won't 'get it' if you start with this one. In fact, though I've read the entire series so far, for me this was oddly hard to follow. It seemed a bit rushed and confusing. Still, if you are a fan of the series it does advance the plot. The scenes aboard the sub. I haven't given up on the author; the first two books were great. I just wont jump on buying until some reviews are posted. I'd hoped book 3 would continue in the same style as the first 2 books. The story was choppy and rushed, with huge gaps missing in the action. The radical departure makes me wonder if it was even the same author. Frustration and disappointment. This was a huge missed opportunity to wrap up the story. I understand military messages begin with a long string on numbers and letters. I get it. Listening to the narrator read them aloud is VERY annoying. I would check Audible every month to see when the third book came out. Finally got it. Bummer. I listened to the entire thing, but forced myself. It was not journal style and I personally thought is was so confusing. There's no refresher from where the last book left off and there are all sorts of new people and six different stories going on, it was just so hard to tell who was what and where they were doing it. And honestly, I just thought it was boring. Oh---and it seemed like it was written for military people. Just so much military jargon. Might be nice for people that know the lingo, but just annoying to me. Don't think I'll be watching out for the next one. Hard to say...loved the first two, but definitely not going to be watching for the fourth book. I don't know...but the narrator was lovely. First, the protagonist's handle is not Killjoy, it's Killroy - And yes, that's a name that originated in WWII. Along with this, there is a lot of military jargon - Both old and new. If you know the jargon, it will add to the experience of the book. If you don't, as some of the other reviewers have mentioned, it will probably leave you a bit bewildered. COB for Captain of the Boat, COG for Continuity of Government, BUD/S for Basic Underwater Demolitions/SEAL, as examples, and of course there's a lot of ballistic and firearm jargon as well. Second, the book has a disjointed timeline. At the beginning, I had assumed that things were happing chronologically or even concurrently. They're not, no warning is given, and it makes the book a bit hard to follow. It would have probably been a little easier if dates and times were given at the beginning of each chapter. It's a much different book than the previous two, and a lot of detail was left out. China and Deep 6 could have been elaborated on quite a bit more. The overall listening time on this was 9 hours. It probably "should" have been around 14-15, to make it as good as the previous two. It's very fast paced, and many important plot details were just omitted. I'm going to listen to it a second time, because I just could not take in information as quickly as it was being delivered. It was absolutely not the reader's fault, either. That man is a genius with reading. The book read more like a debriefing with just main details listed with minimal environment details, character building, and in some places it would just jump from problem description to resolution, with no story telling. Not what I'm accustomed to from Bourne. I feel like I listened to an abridged version of the book instead of the original. Overall, still a great book. Still a fan of Bourne. Think he needs to slow it back down and not write books like he has to write his own mission reports. Sicherlich ist "Shattered Hourglass" das schwächste Buch der Reihe. Schade ist, dass J.L. Bourne nicht wie in den beiden ersten Teilen die Erzählperspektive des namenlosen Tagebuchschreibers beibehält, sondern diesem nur eine von mehreren Handlungsstängen zubilligt. Damit wird aus dem Besonderen etwas Gewöhnliches. Dennoch gelingt es Bourne die Spannung der ersten beiden Teile mit in den Dritten zu nehmen und die Triologie abzuschließen. Insgesammt hätte ich mir eine stillistisch etwas stringentere Fortsetzung gewünscht, bereuhe den Kauf aber keineswegs. Die offenenen Handlungsstränge der ersten beiden Bücher werden geschlossen und man bekommt kurzweilige, spannende Unterhaltung in einer Welt voller Gefahren geboten. Nach dem hervorragendem ersten Teil, und dem guten zweiten Teil habe ich mich sehr auf den dritten abschließenden Teil gefreut. Ohne im Vorfeld etwas verraten zu wollen muss ich sagen das ich von dem ziemlich - fast schon lustlos - heruntergewurschtelten 3 Teil mehr als entäuscht bin.